Sen. Cory Booker, D–N.J. delivered the Commencement address to 2016 graduates on the National Mall. Booker told graduates to remember the people surrounding them. Updated: May 16, 2016 at 8:44 a.m.
For Sen. Cory Booker, D–N.J., it’s all in the details. In his speech directed to the Class of 2016, Booker told graduates that in their drives to make big changes in the world, they should never forget the details and people along the way. He told them to always “stay faithful,” and to be aware of the people helping them, not just of the big goals they are trying to achieve. “Sometimes you get so ambitious running to take the world that you forget that we need to change our world first and foremost, our world of friends, our world of neighbors,” Booker said. Booker, a former Rhodes scholar and Stanford University and Yale Law School graduate, said at times during his crusade against injustice, he has forgotten the people immediately surrounding him. When he was a city council member in his hometown of Newark, N.J., Booker lived in public housing in what he called a violent and drug-plagued neighborhood to better understand the plight of the poor in his city. While he served as Newark’s mayor, he gained online fame and national attention for his interactions with constituents, including rescuing a neighbor from a burning building in 2012, shoveling out an elderly man’s sidewalk and rescuing a dog who was left out in the cold. During his time in public housing, Booker said he befriended a group of boys who lived in the building. Hassan Washington, one of the boys, reminded Booker of his father, with his quick wit and his struggles of being raised by a single mother. Booker said he grew concerned when the boys started using drugs, which inspired him to want to start a mentoring program. About a month into his term, he was called to the scene of a shooting and said, at first, he hardly noticed who the victims were. When he got home later that night and checked the police report, he was “stung” to recognize one victim’s name: Hassan Washington. Booker said his father, who died shortly before he became a U.S. senator, had said, “It’s not about the world. 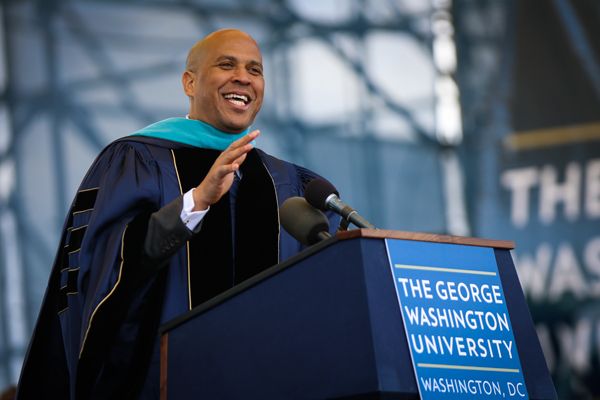 It’s about you.” In that moment, Booker felt as if he had let his father down by not doing enough for Washington. Graduates of the Class of 2016 and their families gathered on the National Mall on Sunday for University Commencement. Booker referenced his parents throughout his speech, shaping his words to the graduates based on advice from his father. He said speaking on the National Mall was a particularly poignant moment because his parents had their first date at the nearby Jefferson Memorial. He said his father told Booker that there are two ways you can go through life – as a thermometer or as a thermostat – and that graduates should always be thermostats to change the world, not reflect it. He ended his speech telling the graduates to “stay faithful,” saying they have succeeded so far by believing in themselves, in each other and in their country. He said he succeeded because he was faithful to the lessons his parents taught him. The social media-savvy senator took selfies with students gathered on the National Mall, and in the hours after the ceremony, Booker responded to tweets from students on Twitter, thanking them for listening to his words and wishing them luck. GW’s Snapchat account, where Booker first announced he would be Commencement speaker, showed students gathering on the National Mall Sunday. Officials had said they hoped to keep the audience engaged during the ceremony by using social media. Julia Haigney, the student speaker who first received her bachelor’s degree in international affairs in 2011 and has now earned a law degree, told graduates to branch out and “try some green eggs and ham” before deciding what their interests are. Haigney said her “green eggs and ham” included moving to a new city, studying abroad twice and living in Thurston Hall three times. She thanked her mentors and the community at GW for their support and congratulated the Class of 2016. At the ceremony, Booker, Baroness Joanna Shields and Albert Harrison Small received honorary degrees. Shields, the under secretary of state and minister for internet safety for the United Kingdom, spoke at the business school’s commencement celebration Friday. Small is a philanthropist and president of Southern Engineering Corporation, a real estate and construction firm. He donated the Washingtoniana Collection to the University in 2011. 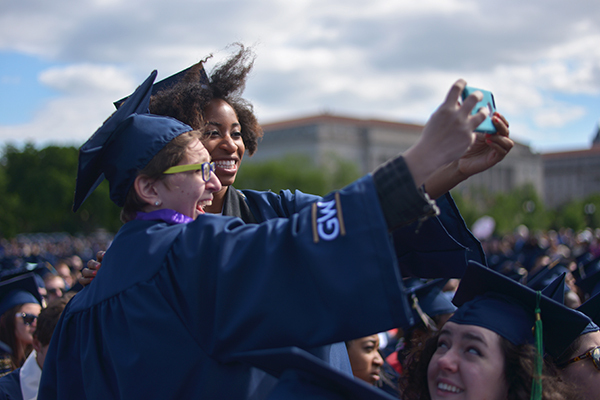 University President Steven Knapp said in an interview that he hopes graduates will use the skills they learned at GW to benefit the larger community.